OK, I admit it: I am as cynical as you when it comes to half-suspecting that enormously ambitious, fanbase-courting independent projects announced before work on them has even begun carry the dread stench of vapourware. I've been very interested in Xenonauts for some time, if faintly horrified that lead designer Chris England claims he made the final decision to pour his life savings into funding an X-COM remake based on an offhand oh-if-only comment I made on Rock, Paper Shotgun, but I confess wasn't entirely convinced it would see the light of day. Partly this was due to the many tales of infamy concerning amateur game devs who started working together remotely without ever actually meeting-–online tensions can run so high-–and partly because I've been waiting a long time for an X-COM remake that actually feels anything like X-COM. It is not in my nature to believe that dreams can come true. A playable build of Xenonauts was on show in the RPS-sponsored Indie Arcade at the Eurogamer expo last week, and pretty much everyone I spoke to about it said the same thing: "well, it's X-COM," they offered with a wide grin. They didn't say what worked or what didn't or what they'd change or anything like that-–they just said "it's like X-COM." I can't think of a greater compliment for any game. I think the same thing. And I'm struggling to know what to say about Xenonauts as a result. Again, this is a compliment. Show me one of those Euro-made UFO games that came out a few years ago, and I could gripe at you for hours about what they did wrong and why they didn't feel right and ewww this and ugh that. I don't have those gripes here-–not yet anyway, as I have only played a fraction of the game-–because Xenonauts feels right: from the tension of alien-hunting on the ground to the micromanagement of soldier inventories and skills to, yes, the destructible buildings. 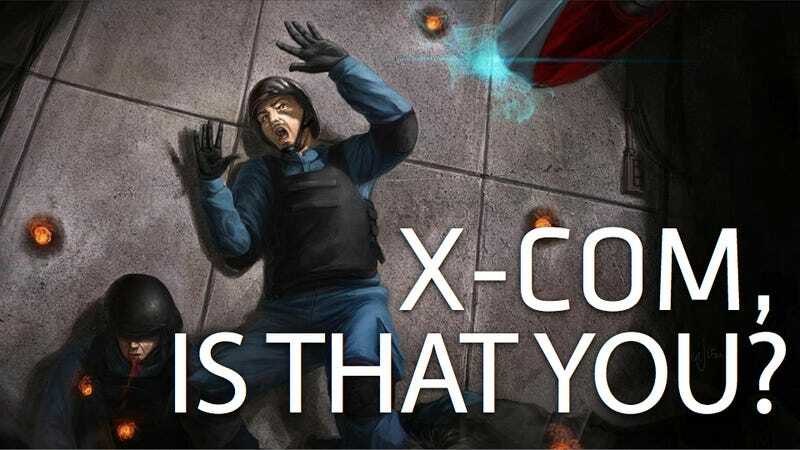 It is clearly made to be X-COM remade for modern resolutions and with a clutch of the interface and control improvements strategy games have seen over the last two decades. It isn't simply a slavish remake, however. For a start, the setting has moved from overtly '90s-styled near-future sci-fi to an alien invasion in the midst of the Cold War, and with that comes a more subdued palette and a more military-realistic look. Much was made at the Expo of how dour your soldiers looked on their inventory screens–-surly, tired, not handsome, clearly having a bad time. It's drawn some complaints, but I am entirely behind this-–send me into the middle of a desperate battle against an enemy unknown and you're not going to find me smiling or spending time gelling my hair into a Rob Liefeildesque upright spray of preposterous posing. These guys are in a terrible situation, and it is only right that this dread knowledge would be written all over their scowling faces. There's a crisp two-dimensionality to Xenonauts, most everything in it looking as though it's been clipped neatly out of cardboard. It's unusual, and that's for the good-–again, this is trying to be its own game despite the comforting blanket that is a genuine X-COMiness. The higher resolution isn't tokenistic, either-–as well as meaning a sleeker interface in the turn-based battles, the global view screen now holds a ton of at-a-glance information, which in X-COM you'd be delving into sub-menus for, placed neatly into the space around the side. It looks thoroughly modern and has, I think, made a lot of smart decisions about how to re-present the slew of stats and facts that a game like this requires without interfering with that familiarly vintage flow or feel. Visually, it evokes X-COM without blantantly just being X-COM-–the camera angle is the same and the original's key tropes–-the globe, the radar-based air chases, the grid-based, top-down base, the troop carrier craft with a drop-down door and a phalanx of somehow nervous-looking soldiers waiting to be unloaded into an ominously silent battleground. It's the feel–-that's the thing. That nebulous X-COMminess that has evaded so many other pretenders to the Gollops' forcibly abandoned throne. Balancing the urge to rush my soldiers forward to locate the enemy with the itching dread that one step too far would mean sudden death. Deciding that 40% odds of a shot being on target were odds enough, instead of spending my last action points on getting my guy to cover when he's eyeball-to-eyeball with a distressingly humanoid alien foe. • The RPS Verdict: The Binding Of Isaac "So now I am the guy who compulsively attacks faeces for no good reason." • Mods And Ends: Lashings Of Doom "'I've given you infinite Doom maps. My work here is done.'" • Impressions: Trackmania 2 "'Despite its back-to-basics, almost puritanical approach, TM2 somehow manages to be incredibly confusing too.'" Worrying, plotting, gambling, grimly/joyfully blowing up a wall to get a quicker, safer, but noisier view inside a darkened building. Doing things that felt like second-nature, but in an unquestionably 2011 game. There is new stuff–-like an expanded air chase mode and soldier inventory/stat management system, a more thought-out cover system or needing to first shoot out a window before you can shoot through it-–but it seemed like evolutions of a known and successful formula, not change for the sake of change. All this even though Xenonauts still has plenty of work to be done-–the dev kept apologising for placeholder art and buggy features. That stuff doesn't matter, because Xenonauts really exists, is really real and really does what it promised it would do. Really. You're going to very happy. The game's full launch is some time away yet, but if you pre-order now you'll get access to the build I played at the Expo, plus future updates (and, of course, you'll be helping to fund development). I'm not sure, at this stage, exactly what it is that X-COM fans will get angry about, but I am quite sure they will-–maybe the grumpy-looking soldiers, maybe the slightly fussy air combat, maybe the less sci-fi design of the human forces and weapons, maybe the fact you can't blow your way inside a UFO as you can a building-–but I am quite sure it will be little more than nit-picking. With 2K's (let's put it mildly) divisive XCOM FPS fast approaching, there just isn't a better time for Xenonauts to exist. Xenonauts will be released when it's finished, but access to early builds is available immediately to anyone who pre-orders. Alec Meer is a writer for Rock Paper Shotgun, one of the world's best sites for PC gaming news. Alec's true power is in his ability to charm us with a smile and a sunny outlook. Follow him on Twitter.